Global Payments is one of the largest merchant service providers in the world, processing more than 1.2 billion payments each year. The company offers merchant services to more than 2.5 million merchants across 29 countries, and accepts all major credit and debit card schemes including China’s UnionPay. Global Payments also offers very attractive all-in-one services, including e-commerce solutions, online payment gateways, and merchant account services. As a large company, Global Payments is also able to offer very attractive transaction fees and pricing. Who Should Use Global Payments Merchant Services? If you’re considering using Global Payments, the company will likely offer something that suits your needs. Global Payments currently owns about a 20% market share in all card processing globally, which means that they offer a great deal in terms of volume-based price cuts, diverse services, and currency conversion. However, you should also be aware of hidden fees, markup, customer service issues, and other problems that may make your contract with Global Payments less than ideal. The following Global Payments merchant services review includes everything you need to decide if Global Payments is right for your business. Global Payments offers a clear payment structure, customized to the business. Your individual quotes and rates will change based on your transaction volume, business type, and industry. Because Global Payments also charges Interchange + rather than a flat rate, you will also pay different card processing fees based on which card your customer uses. In most cases, you can expect to see a simple Interchange + rate with a transaction fee plus dues and assessments added onto the transaction. Because Global Payments tells you which costs are there’s and which are interchange, you can have a better idea of who you’re paying and why. For most business owners, this works out to about 1.1% + Interchange or a flat rate of about 2% for online payments. You can also expect individual pricing for services, including payment gateways, terminal leasing, your merchant account, and any additional services such as a virtual terminal. However, these rates and fees will change based on your business size and transaction volume. You can also work to negotiate, but as a smaller business, you will have little room to do so. What is True Rate Pricing? Global Payments offers something they call ‘True Rate” pricing, which is in contrast to “bucket pricing”. With bucket pricing, you pay a flat rate based on which card your customer uses, typically 3.9% + 8-15p for small business users and as low as 2.5% + 8-15p for larger business users. This can be advantageous if you process a lot of high-interchange card transactions. “True Rate” pricing gives you the actual interchange rate with Global Payments’ markup and fees per card, meaning that your transaction rate changes based on the card. These fees are calculated based on a traditional key-entered Visa card purchase of £100. Most smaller businesses will typically pay higher rates than this (Ranging from about 1.1% + 19p to 2.1% + 19p), but the final total is still lower than using a service like PayPal. However, there are other disadvantages, such as transaction volume requirements and a longer contract with termination fees. Unfortunately, you will have to contact Global Payments to request a quote based on your transactions, and they will send you a custom price list. You will have to request that they include all fees, monthly minimum fees, and monthly rates per service. Global Payments offers a full range of merchant services, including online payment gateways, merchant accounts, card machines and terminals, checking services, and industry specific solutions. Global Payments offers multiple payment gateway services including a standalone service and an integrated merchant account. GP WebPay – GP WebPay is Global Payments’ flagship payment gateway, offering online transactions, custom checkout pages, and a variety of e-commerce services to sellers. This service does not come with a merchant account, so you will have to set one up separately through Authorize.net or pay Global Payments to do so for a higher fee, but enables you to accept all major credit and debit cards and digital wallets, set up loyalty and gift card programs, and create FastPass checkout for return customers. GP WebPay automatically translates to 20 different languages, and offers secure checkout with fraud prevention. Global Iris – Global Iris is an integrated payment gateway and merchant account with optional virtual terminal and multiple integration options for accessing payments via redirect or directly on your site. Like GP WebPay, Global Iris supports 12-32 currencies in 20 languages, supports all major credit and debit card schemes, and features security and fraud prevention. Global Iris uses Global Payments Gateway. Global Payments offers a simple merchant account service integrating into their and other card processing services. The account offers fast approvals with real time online transaction reporting, but actual processing times depend on the day. Most transactions are processed within 2 business days. Global Payments offers a variety of own-brand and third-party brand card machines and POS terminals, mostly offering brands like Ingenico and Verifone as part of package deals with their software and merchant account. Global Payments creates custom payment solutions for industries including retail, e-commerce, restaurant and hospitality, catering, healthcare, non-profit, gaming, payroll, education, micropayments, and salon or spa. 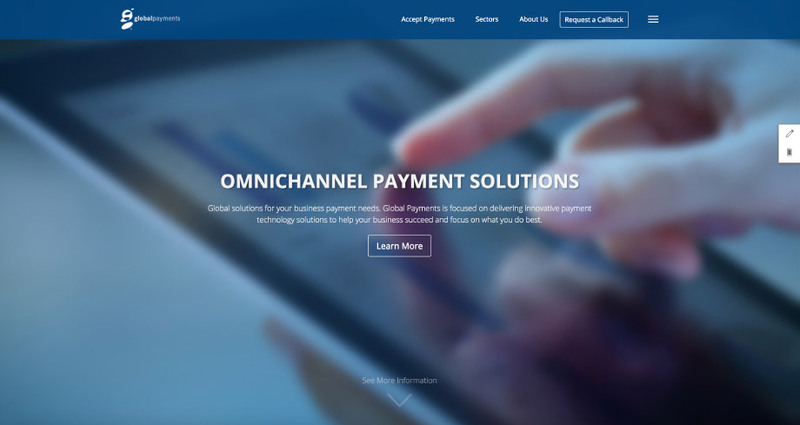 This makes it easy to get highly tailored payment solutions, integrating the solutions, software, and hardware you need to make payments easy for your customers. The merchant service provider’s largest demographic is small to enterprise e-commerce operations. Global Services offers three e-commerce checkout pages, including HTML Clone with Secure Page, a Secure Form with redirect to an external checkout, and a shopping cart plugin which integrates into al major shopping carts and e-commerce platforms. Global Payments offers primarily Ingenico PDQ machines in the UK but you may be able to request other brands such as Verifone as well. The company also offers two software solutions with card machine packages. Global Pay Now is a card processing program designed for the hospitality industry, capable of automatically transferring bills from an EPOS system directly to a portable card machine and automatically to the till. This allows wait staff to bring a portable card machine to a table, key in a transaction, and then process it, accept funds, and print a receipt without leaving the table. And, because transactions are automatically transferred back to the till and the EPOS, both stay up to date without the need to double key. Global POS Link is an integrated payment system designed to link desktop terminals and pin pads to till systems. Using POS Link, transactions are switched from till to terminal and back automatically, removing the need to double key. Global Payments offers a free mobile app and mobile card reader for accepting card transactions in mobile situations or on location. The app is free, and the reader is provided free with contract. Global Payments offers several contract terms, starting at 12 months for terminal rental or lease and 12 months for merchant account services. Most contracts include a one-time-setup fee averaging between £150 and £250. Contracts are available extending up to 36 months. Should you wish to cancel after the contract period is over, you must offer a 1-month notification of termination in advance, or Global Payments will fine you for additional costs incurred. Should you wish to cancel during the period of the contract, Global Payments charges a steep early termination fee based on the number of services you are using, with rates ranging from £150 – £500+. This termination fee is very high, even compared to similar services, so if you aren’t sure about the company, you should choose a shorter contract duration. Global Payments is one of the largest online payment service providers and as a result, they have a great deal of both positive and negative reviews. However, Global Payments has a great deal of negative reviews from smaller businesses, largely relating to freezing funds, higher costs on card processing, poor customer service, and termination fees. Freezing Funds – Global Payments integrates a strong security feature, which may result in funds being frozen for review. Unfortunately, this will freeze your entire account and all pending transactions. Customer Service – Customer service representatives are often unable to tell you anything without you offering all of your business details and filling out a form. This means that you cannot ask casual questions, and you may not be aware of items like statement fees. Customer service also sometimes have issues with being unable to resolve problems. Card Processing – Global Payments offers payment gateway services, but typically through third-party services such as PayPal or Authorize.net. If you sign up for these services through Global Payments and they set it up for you, you will pay significantly higher rates than if you set the service up yourself. However, Global Payments does allow you to do so. Termination Fees – With very high early termination fees and difficulty cancelling contracts, it can be difficult to impossible to get out of a contract if your business goes bankrupt, you find a better deal, or otherwise cannot use Global Payments. PCI Non-Compliance Fees – If Global Payments detects that your business is not PCI compliant, they fine you. While fees vary depending on the PCI compliance issue, customers have reported an average fine of about £100 – £190 per month. Global Payments has a large customer service team offering 24/7 online and phone support. However, you may find yourself on the phone for more than an hour to resolve problems, will be transferred often, and may not have your problem solved. Many of Global Payments’ customer complaints revolve around customer service not resolving issues, promising solutions and not delivering them, or taking several weeks to deliver items like replacement card machines. Global Payments often relies on resellers to market their offerings, which can result in price hikes, hidden fees, and increased setup fees. If you’re working with a third-party provider, you may be paying considerably higher fees than by going directly to Global Payments itself. Sales representatives are also often paid via commission, meaning that they may use pressure sales tactics, attempt to sell you things you don’t need, or make promises they can’t keep in order to get you to sign a contract. Make sure you read any contract in full, get a full price sheet for any costs and fees, and understand what you’re signing up for before doing so. Most importantly, you should always read the contract, especially if your sales representative says it isn’t necessary. Global Payments is a large merchant service provider, and one that competes directly with other top providers like HSBC, Elevon, and WorldPay. You may also consider small business solutions like Sage Pay. Unfortunately, it can be difficult to compare merchant service providers based on their general rates. Almost all large providers like Global Payments offer custom pricing based on industry, transaction volume, and even business type. Getting a custom quote from each of the merchant account providers are you are considering will give you a much better basis for comparison. Global Payments offers merchant services tailored to SMEs as well as enterprise, attempting to offer bespoke solutions for most businesses. However, while Global Payments does offer a lot for small business, they aren’t necessarily the best fit for small business. For example, you will get much lower rates if you set up your own payment gateway through PayPal or Authorize.net, adding complexity and an additional bill to online commerce. Global Payments also doesn’t offer enough in terms of customer support and rapid terminal replacement to ensure that small business owners can keep payment solutions online – simply because a small business with less than a dozen terminals cannot afford to wait two weeks to replace a terminal. In combination with high PCI non-compliance fees and high termination fees, Global Payments can be too expensive for what you get should something go wrong. However, Global Payments is one of the largest and most respected merchant account providers. Larger businesses can greatly benefit from reduced transaction costs, especially when they have the infrastructure set up to ensure that they maximize savings. Global Payments offers API, site cloning, and strong tools to make sales as easy and secure as possible. Global Payments processes roughly 20% of all card transactions in the world, with operations in China, Europe, Australia, and the United States. Using the company gives you access to strong security, fast transaction processing, online reporting, and a variety of industry specific tools to help your business succeed. However, with a large number of complaints surrounding Global Payments’ treatment of small business through either transaction freezing, poor customer support, or high fees and fines, the merchant service provider is not always a great fit for small business. Despite that, Global Payments still offers among the lowest transaction rates in the industry, with highly competitive monthly fees, and a transparent price list offering an actual look at what they are charging over Interchange +. If you choose to work with Global Payments, make sure you work directly with the company, try to set up your own payment gateway, and read the contract in full before signing it.